The love of my life is my senior dog Red who is approximately 17, although I really have no idea how old she is. Okay I know I should say it’s my husband but, to be fair, he’d probably say his is our other dog Jack!! We’ve been together almost 9 years (Red, not my husband!! ), and I can’t even imagine how much I’ve spent on vet bills. Of course she’s worth every penny, but that doesn’t mean sometimes I wouldn’t like to spend some money on myself! The biggest money saver for me is buying medications online, but there are a lot more things to do than just that. Keep in mind how important preventative care is for your senior dog’s health. Preventing issues is cheaper than treating conditions. These tips are perfect for all pets, all ages!! 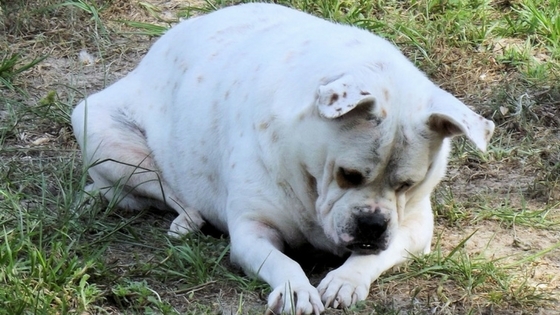 If your senior dog is overweight because you’re feeding him too much, you’re wasting money. If it’s because he’s not getting walked, start walking him. Either way his health is being jeopardized because fat dogs are more prone to things like diabetes, arthritis, heart disease… and with those conditions come expensive vet visits and treatments. Keeping your dog at a healthy weight in no way guarantees he will always be perfectly healthy, but it does certainly help. Whether you make your own dog food, dog treats or throw in some veggies to make his diet more appetizing, buying ingredients in bulk can save you quite a bit of money. It is recommended that senior dogs see the vet twice yearly, even if you’re sure there’s nothing wrong. Blood and urine tests can pick up issues before your dog even exhibits a symptom. Treating anything in the early stages is not only obviously better for your dog’s health and wellbeing, it makes financial sense as well. One of the main reasons for senior dog surrender is a pet parent who cannot afford the vet bills, and that is heartbreaking to me. Low cost does not mean low quality care, it just means there is an option for those who qualify to use this service. Veterinary schools sometimes offer clinics at a lower fee, as do some shelters. You may be surprised at the wide range of pricing vets charge for the same tests, so while you’re looking for that “great” vet, discuss costs as well. Be sure to ask about their senior dog wellness checks, what’s involved, and how much they cost. Please don’t be fooled into thinking expensive automatically means superior, sometimes it means you’re helping pay off expensive medical equipment. I’ve had horrible experiences in a state of the art hospital, and met the most incredible vet at a husband and wife clinic. I have to add this even though it’s obvious – please don’t base your entire decision on cost alone. Why is all this good you ask? A bored dog with too much energy will get frustrated, which can lead to destructive and even aggressive behaviour. Money is spent on training, not to mention replacing your favourite shoes, and instead of saving money you’re wasting it when all he needed was a walk…or three!! Most of my dogs are good about taking pills. They know I hide them in their favourite foods but they just don’t care. They’re excited about what they’re getting to eat they’re not bothered by my deception. Of course they can’t all be like that can they? I have had a couple who knew exactly what I was doing, and would never let me get away with it. That’s when I discovered Pill Pockets. They can get costly if you need to use them every day, so why not save money and make your own! I came across this super easy recipe – All you do is mix 1 tablespoon of milk, 1 tablespoon of crunchy peanut butter and 2 tablespoons of any type of flour. Use a chopstick to create the hole and refrigerate or freeze. Make sure the ingredients are safe for your dog. If you can find the same medication in generic form, why not? It can save you a significant amount of money, but check with your vet to make sure the ingredients are what he needs. At the end of every day take out all the pennies, dimes, nickels or quarters (whatever denomination you like) and put them aside for unexpected vet bills. The balance will grow quickly, and those extra dollars could mean the difference between paying your bill, and incurring interest on a credit card. In many cases, there are massive price differences between a product purchased from your vet and one bought online. Whether that’s a brand of food, medication or supplements. A lot of online retailers offer a coupon code for first time buyers, be sure to take advantage of those savings. If your vet recommends something your dog needs now of course buy it, but take the opportunity to shop around for cheaper elsewhere, and take notice of delivery charges. If you’re looking for a prescription medication don’t forget to factor in the cost of your vet writing one for you…unless yours does it for free. Make sure the company you buy from is reputable, and the drugs dispensed are what they claim to be. If you’re in the States, check out some online Canadian companies because you can find huge savings. If your senior dog has restrictions on what he or she can eat, it can be very challenging finding readymade treats. Making your own means they will no longer be left out. 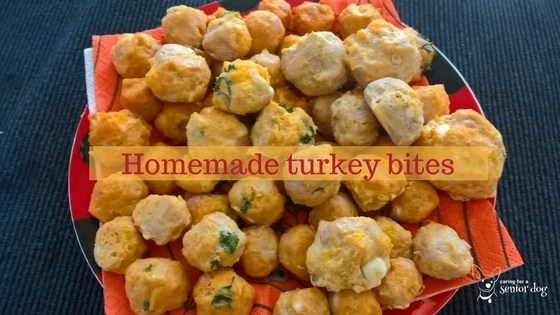 Check out these Pinterest links for some great recipes. One thing I always recommend asking after a neighbour of mine told me this story is if, for example your dog has an ear infection in one ear, will they cover it if it happens in the other? Sounds crazy but her insurance company wouldn’t!! Just like many of us buy supermarket and drug store own brands to save money, you may be able to do the same with pet supplies. Ingredient lists are often similar and you’re not paying for fancy packaging or huge marketing budgets. Does your dog love jerky but it’s costing you a fortune keeping him supplied? Make your own and here are a few recipes to get you started. Whether that means wash, cut and blow dry or just a nail trim, doing some or all of your dog’s grooming can keep more money in YOUR wallet. Do you have a pure breed? It seems Labs, Retrievers and Shepherds are more prone to arthritis. While that in no way guarantees they will be affected, knowing they have an increased likelihood means you can take preventative measures now…even though your dog is older. Giving him glucosamine or New Zealand Green Lipped Mussels for example, could make a big difference down the road and huge savings as well. If you have favourite stores you like to shop at, ask if they have a loyalty or rewards scheme. Whether that means having a card stamped or receiving coupons in the mail, it’s another way to save money. I’ve mentioned to my vet he should have a loyalty program – having a card they stamp with every 10th visit free, 5th for me!! Needless to say he didn’t go for that idea! You know the expression “you get what you pay for?” While I know not every bargain will break when you get it home, it’s important to be careful with toys. If it falls apart quickly you’ll end up spending more because you’ll have to buy the better quality one anyway. If it can be chewed and swallowed you’ll have expensive vet bills, not to mention a potentially deadly situation on your hands. For the “DIYers” and “crafters” out there, why not make your own? 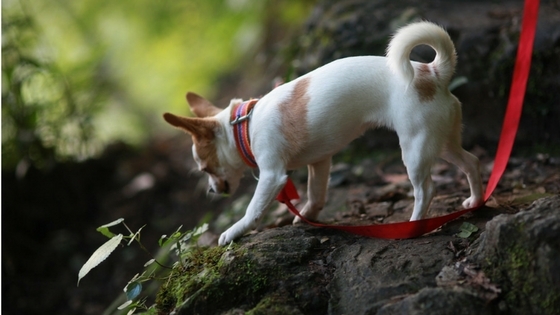 Here are some ideas your dog will love. Where do you buy your bones? If your dog loves his bones, how much is that “love” costing to satisfy? Ask for bones at your local butchers or supermarket meat counter. They’ll be cheaper, healthier and possibly even free! Compare the cost of flea and tick medication, versus what’s involved in ridding your home, and dog, of fleas. What about the financial and physical toll a positive heartworm test can have on an old dog, who may already have health issues? Hire a house sitter for free! The next time you’re thinking of going away and aren’t able to take your senior dog, how about looking into Trusted Housesitters. This company connects you with people who are traveling who will look after your pets at no charge, in exchange for free lodging. I don’t have any experience with this company, that’s something you will have to investigate, but it is an option to explore. What service can you offer in exchange for free pet sitting? Dog shampoos are so concentrated you can often dilute them, saving you a ton of money. Some brands are so helpful they even list the dilution ratio on the label!! If your senior dog is anything like mine, what she found comfortable a few months ago, is no longer to her liking today. She also prefers having 2 or 3 different types to choose from, depending on her mood. Quality dog beds can be costly, especially if one isn’t enough, so how about making your own? There are tons of DIY projects on Pinterest to suit every ability level, even mine which actually is not even measurable it’s so bad! I spend an awful lot of time at the vet’s office, and rely on him to help me care for my senior dog Red. I also know that sometimes going to the vet and paying for a conversation isn’t necessary. 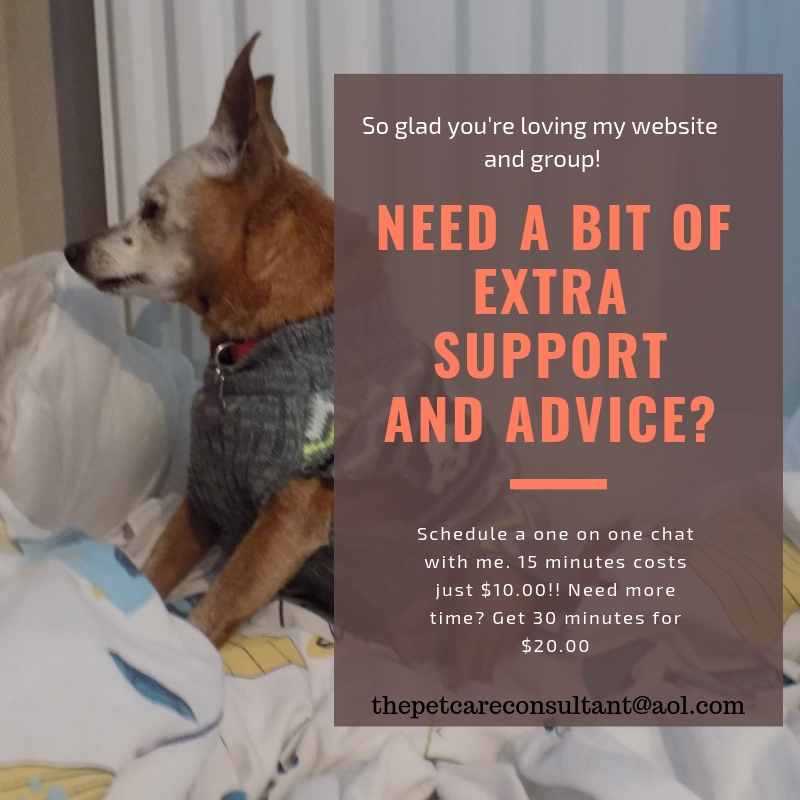 I am certainly not recommending you replace professional advice, what I am saying is there are many instances where watching a Youtube video created by a professional, or joining a Facebook group like mine (Senior Dog Care Club) can provide you with the answers you seek…or at least give you a starting point. For example, if your dog is experiencing anxiety there is a lot of helpful advice out there, and you’ve saved a consultation fee. I do recommend you check with your vet once you’ve found some products you’d like to try, but that can usually be done by leaving a message with the staff or sending an email, both at no cost. 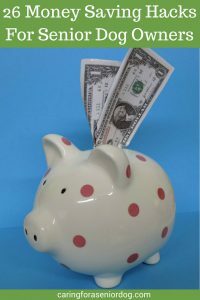 What money saving hacks do you have? Sharing helps others so please leave them in the comments section below or my Facebook page Caring For a Senior Dog. So much great information in this post. I can totally relate to the expense of caring for a senior dog, especially one with an illness (have had ones with cancer and heart conditions). The medications can be so expensive and so can special prescription dog food. It’s definitely worth it to cut the expenses in any way while not sacrificing what is needed to keep a pet happy and living a good life (for as long as possible). I know what you mean, Red is costing us an absolute fortune but what can you do, we have to care for them the best way we can. Cutting costs when possible does make a difference. Great tips and advice even if you don’t have a senior dog! Regular vet checkups, proper nutrition, keeping your dog at a healthy weight, and regular exercise are all so very important. Absolutely true, they’re perfect for the care of any animals really. These are great tips, and I used some of them when my Magical-Dawg was still here. Thanks for all the detailed recipes, too! Thanks Amy, happy you found them helpful. Great advice specially on not skipping the vet visits. At the end not providing a good health checkup will cost more in the future. I will have to check the senior care club for my dog. She is not an elderly dog yet but want to be ready. Trying to save money by not going to the vet will absolutely cost more when you have to pay to treat a condition that could have been dealt with early. I’m spending a fortunate for a senior dog and I find staying with the same Vet might not be cheaper, having them know you is invaluable. Also, I have started comparing the prices of prescriptions. Sometimes they are cheaper at the ‘people’ pharmacy and are the same pills. For instance, dog eye drops for my dog cost $43 at the vet but the exact same eye drops for me (turns out I had the same prescription) are about $20 or $4 on my drug plan. I couldn’t agree with you more Sherri. I wouldn’t look for a new vet to save money, because I’m never going to find one who can care for Red the way mine does. There are massive differences between my vet and online suppliers, many are half price a couple even cheaper than that. This list is great! Pets of any age could benefit from these things. I think that prevention is the biggest money saver for any pet. You can’t prevent every disease and disorder, but why pay for the ones that you can prevent? The heartache that goes along with having an ill pet is just as difficult as paying for the vet bills. Thanks Robin, yes this list applies to different pets of all ages. You’re so right about prevention being a big money saver, and how much heartache we can save ourselves in the process. Lots of great advice – not just for senior dogs but for dogs of all ages! Thanks for putting together the list! Thanks Mishu, definitely tips to be used no matter how old or what type of pet you share your life with. Great tips! We do many of these already. We’re big on preventative care like keeping him slim, making sure he’s up to date on meds and shots and giving him supplements. Preventative care definitely goes a long way to saving money. Great advice! I have one other tip. One of my dogs was on an expensive chemotherapy drug which was also the same drug given to people. The pharmacies doubled their price at the start of the year! My husband found that we could get this same drug from Canada for about 1/4th of the U.S. price. My vet was hesitant, but checked it out and found out the drugs I got were from a reputable company. So check out Canadian drugs. Thanks for that tip Sandy I’m going to add it. You just reminded me – I had read some years ago where people were ordering human drugs from Canadian companies because they were so much cheaper. 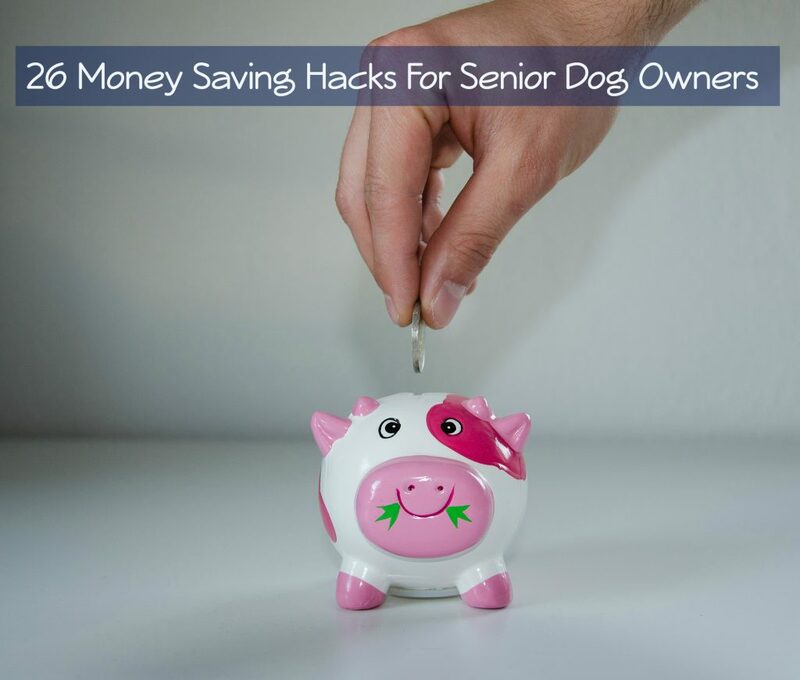 Great recommendations about saving money for senior dogs., This can work for all pets. We do have pet insurance and we’re lucky that most of our issues are covered and we aren’t penalized for pre-existing conditions that happened once we were insured. I dropped one insurance company who had that type of policy. These tips can absolutely work for all pets. It’s tough to find a good insurance company, so much small print, I’m happy you found such a good policy. These are great money saving hacks for cat owners too. I never owned a dog but definitely used some of these money saving tricks when I was raising my cats. They definitely work. My favorite ideas were diluting shampoo, making my own toys, getting pet insurance, grooming my cats myself and shopping around for affordably priced vet services. These tricks work. Thanks Kamira, they definitely work for all kinds of pets. My husband bathes our dogs himself, especially Jack who likes to roll in things between grooming visits. Diluting the shampoo is such a great idea because it’s so thick a lot gets wasted, especially because hubby is very liberal with it! I think camaraderie is one of the most important things to help with senior dog care. Lots of others are dealing with the same thing. Finding a good FB group could be key. I couldn’t agree more Amy. I often here members say how grateful they are I started the senior dog group, because they have a support system. Not to mention all the great tips and advice we all learn from each other. What an awesome list. Generic medications are still underappreciated and underutilized. Many drugs have a generic counterpart. Thanks Jana! You’re right there is often a generic version, and can be significantly cheaper. Makes a huge difference when it’s needed long term.